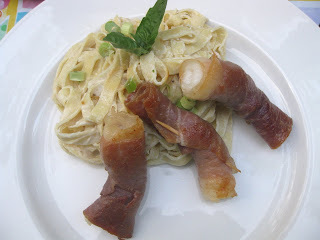 Last week in the Columbus Dispatch food section (or what is left of it these days) I saw this recipe for prosciutto wrapped shrimp with fettuccine. It caught my eye! Not only did it sound absolutely divine, but it didn't look too time consuming or difficult either. Definitely something I could whip up for a weeknight dinner. Here is the recipe as printed. The only change we made was to substitute half of the goat cheese with Laughing Cow Light Cheese. It is a good melting Swiss cheese with a few less calories. Heat the oven to 200 degrees. Bring a large pot of salted water to a boil. Tightly wrap each shrimp in a slice of prosciutto (secure with a toothpick). In a large skillet over medium-high, heat the oil. Add the shrimp, cover and cook, 2 to 3 minutes a side, or until the prosciutto is browned and crisp and the shrimp are pink and cooked through. Transfer the shrimp to an oven-safe plate and place in the oven to keep warm. Reserve drippings in skillet. Add the pasta to the boiling water and cook until tender but still firm to bite. Drain. Return the skillet to the stove over medium-high heat. Add the wine and heat for 30 seconds, scraping up any bits from the bottom of the skillet. Whisk in the goat cheese, then add the pasta and toss until well coated. Season with salt and pepper. Divide the pasta between serving plates. Top with the prosciutto-wrapped shrimp and sprinkle with green onions.